The Democratic Revolution Party, or PRD, staged a contentious and yet-undecided internal election on March 16 that threatens to fracture the left-wing party. Mexico’s other left-wing party, the Social Democratic Alternative, or Alternativa, also faces a similar fate on Sunday, when it selects a new slate of national leaders. Even worse for Alternativa is the distinct possibility that the three-year-old party could disappear entirely after the 2009 midterm elections if its official status is rescinded by the Federal Electoral Institute, or IFE. “How it [breaks up] is problematic because it’s not big enough to split successfully [since] neither side could actually survive,” said Jeffrey Weldon, a political science professor at ITAM. The outcome could also see Alternativa lose its best-known figure, Patricia Mercado, a prominent women’s rights crusader whose maverick 2006 presidential campaign garnered attention by highlighting controversial social issues like drug legalization, gay rights and access to abortion. Mercado’s campaign won the Alternativa five seats in the Chamber of Deputies and enough votes to remain registered with the IFE. 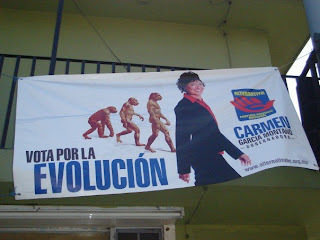 But her success – becoming Alternativa's public face – and agenda-driven approach to party-building sparked disquiet in the party's senior ranks. Luciano Pascoe, the Alternativa's IFE representative described Mercado as “gold” for the party, but accused her of claiming too much credit for past successes. “We invested every penny this party had in her image,” he said. Mercado is vying for the Alternativa presidency against incumbent Alberto Begné, a former IFE official. Mercado accuses Begné of selling out the party’s original social democratic agenda by forging alliances with political rivals that guarantee money and legislative seats rather than pushing her social agenda forward. Her supporters also accuse Begné of employing thug tactics at local-level conventions – six of which have resulted in complaints to the electoral tribunal, or Trife, that were dismissed on Friday. Mercado told The News that “hired goons” from the National Polytechnic Institute were unleashed on her supporters at Alternativa’s Mexico City convention on March 16. She also accused party leadership of swelling her opponents’ ranks with PRD supporters. Pascoe denied Mercado's allegations. He also defended the Alternativa's party-building strategies and said Mercado was running her side of the party like a “caudilla,” or strong woman. “We can't afford to build a party that's focused on one person,” he said, describing that strategy as the principal weakness of Mexican political parties. The party was founded in 2005 with the idea of providing a “modern left” that would promote individual rights and break from the tendencies of some PRD and PRI leaders to form patronage alliances, said Alternativa Deputy Aida Marina Arvizu Rivas. But it got off to an awkward start as a coalition of social activists pushing for minority rights, intellectuals who were previously affiliated with the Institutional Revolutionary Party, or PRI, and several campesino groups. Tensions surfaced almost immediately as the campesino wing advanced the presidential nomination of Víctor González Torres, a discount drug baron famous for womanizing. González Torres, a self-described populist better known as Dr. Simi, promised to bring a war chest to the Alternativa campaign, but the IFE quashed his bid by ruling in favor of Mercado. The campesino wing later crawled back to the PRI in the waning days of the campaign. Mercado went on to lead a shoestring campaign that caught fire after she performed strongly in the first presidential debate. She gained further notoriety by attending a rally promoting marijuana legalization in Mexico City’s hip Condesa neighborhood. In the end, Alternativa wound up with slightly less than 3 percent of the presidential ballots – enough to deny López Obrador the presidency. The result also allowed the Alternativa to exist as a registered political party that receives public funding from the IFE – 130 million pesos in 2008. But spending irregularities from 2006 resulted in a 15 million-peso fine last year, forcing the party to depend on a 60-million-peso line of credit that is still being repaid, according to the El Universal newspaper. Mercado said the party was being run as a “franchise” – a factor driving the current leadership to forge alliances with larger parties that can guarantee continued funding for the Alternativa. Estévez attributed much of the Alternativa’s discord to money rather than ideological and strategic differences. He also noted that Mercado has a history of being involved with upstart political parties in search of public financing and she mortgaged her house during an unsuccessful candidacy in 2000. Estévez predicted the ongoing Alternativa row – and the turmoil engulfing the PRD – would persist due to the high stakes involved. “National party leaders have enormous power in this country, legal power as well as financial support, so it’s worth fighting practically to the death,” he said.